I don’t often talk about music on this blog, but when I do it’s usually Garbage. Joking aside, on Thursday the 10th of March, my favourite alt-rock veterans finally announced the official release date of their sixth studio album. It will be titled ‘Strange Little Birds’ … a title I found quite bizarre at first, but it’s grown on me the more I say it. Now we also have the cover art (again, equally unusual but I like it) and track listing . Alongside this news the band also revealed a short European tour that will also cover two dates in the UK. Sadly it’s looking like I won’t get chance to see them live this time around. This is for various reasons but not helped by the fact I haven’t anyone that’s particularly into them or aware of them. However I remain really excited for the coming months and will be glued to whatever this talented four piece get up to next. 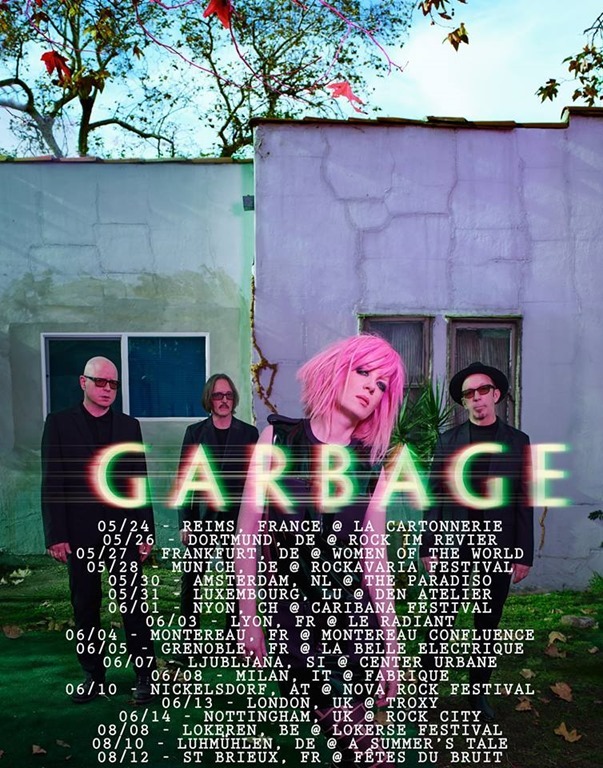 Shirley Manson, lead singer had this to say about the new album: “To me, this record, funnily enough, has the most to do with the first record than any of the previous records,” Manson said. “It’s getting back to that beginner’s headspace. In part, that’s a result of not having anyone to answer to.”, and she added “The guiding principle was keeping it fresh, and relying on instinct both lyrically and musically”. Strange Little Birds will be released on the band’s own label Stun Volume and will be out on 10 June 2016. Tour dates are listed below. I’d imagine further U.S. dates will be added at some stage as well. This entry was posted in Blogging, Music, News and tagged Butch Vig, duke erickson, Garbage, Shirley Manson, Steve Marker, Strange Little Birds, stunvolume by Craig M. Bookmark the permalink. The anticipation and excitement grows each day for these Strange Little Birds to fly into my world. Oh I sow hear you, man! Thanks for the comment.